Thanks the The Hunger Games' official Facebook page, we now have more details on the Catching Fire global fan day coming up on November 6th. 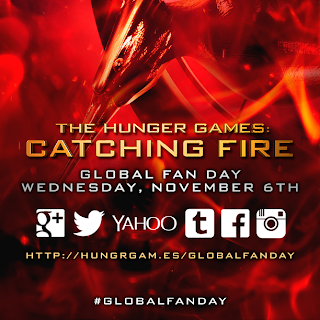 Excitingly, a brand new clip from the Catching Fire movie will debut on Facebook! 11AM PT - GOOGLE+ HANGOUT: Six lucky fans will get the exclusive chance to participate in the ‘Hangout On Air’ with Jennifer, Josh, Liam and Francis & ask their questions directly to the cast, but anyone can attend from home and ask questions LIVE via their Google+ account or on YouTube!